The Ember Tetra is an often-overlooked tiny tetra perfect for your next planted tank! With planted tanks and nano tanks being all the rage, tiny, colorful fish are ever-increasingly in demand, but most of us we crave the absolutely latest introductions—admittedly it’s hard to get excited about the same fish that we’ve seen for 30 years. Of course, there are so many species out there, once in a while we have to stop and realize that something “old” is still new. Such was the case for me, stumbling across the this video of the Ember Tetra, Hyphessobrycon amandae. This species is relatively recent in the grand history of tropical fish, having been described only in 1987. I haven’t yet pinned down when they first showed up in the trade. Being small and probably arriving rather stressed and washed-out, it’s not surprising that this species is one I would have readily overlooked in my youth in favor of more commonplace things like the ubiquitous, albeit nippy, Serpae Tetra, Hyphessobrycon eques, or maybe if I was lucky to find some Red Phantoms, Hyphessobrycon sweglesi. I probably overlooked them, if they were available, when picking fish at area wholesalers in the 1990’s. Tyler Albrecht, of APACHE Tech LED Lighting and the former Dolphin Pet Village in the Campbell, California, had this recollection when I told him AMAZONAS was taking a fresh look: “I think we really only saw our first Ember Tetras about 10 years ago, right when we moved the shop”. Since then, even smaller, arguably more vibrant fishes like the Brigittae or Mosquito Rasbora, Boraras brigittae, have really stolen the spotlight. So I probably shouldn’t be surprised that even now, I can be caught off guard by a species of tetra that’s been lurking around for a number of years. Maybe I just hadn’t seen the right video or photograph yet. But in the past week, not only did I stumble across some striking online displays of this diminutive red tetra, but got to see them firsthand at Forest Lake Pets (in Forest Lake, MN), where they lit up their tank with a vibrant display. These tiny, fiery red tetras certainly earned their common name. And yet, for all their coloration, they are not gaudy or blatantly obvious. Instead, they work into a planted aquarium like tiny hidden presents, that reveal themselves through their movement and flashes of coloration. Yes, I truly have newfound love for this wonderful species. 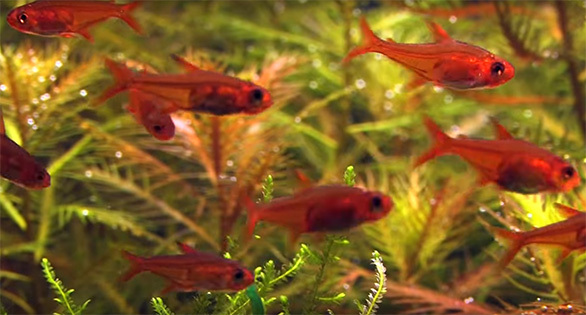 Check out this video of 40 Ember Tetras (Hyphessobrycon amandae) in densely planted aquascape! Additionally, Pedro Rosa has shared a couple exceptional videos showing the impact a “large” school of these tiny tetras in a stunning aquascape. Enjoy!